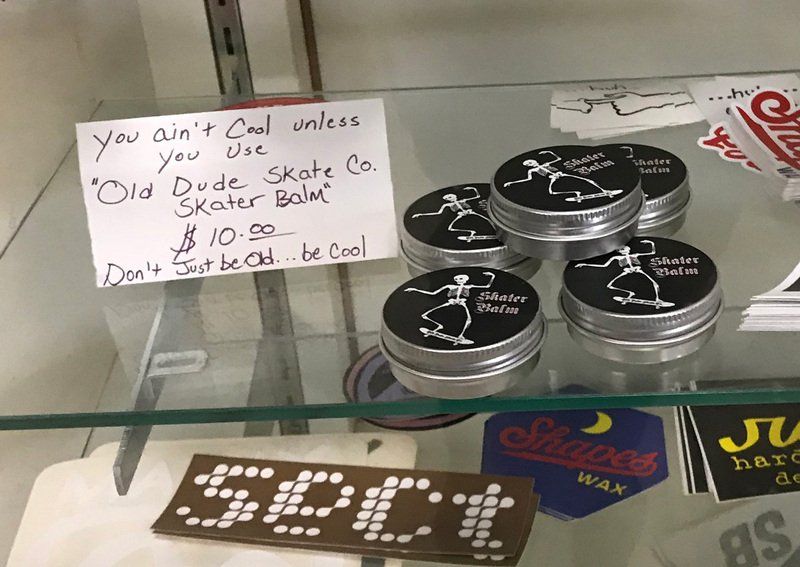 Old Dude Drew, Author at Old Dude Skate Co.
My passion is skateboarding and I do my best to get out and skateboard a minimum of once a week with my “Barn Burner Crew”. Sunday has become that day for the past few months and my partner Aaron drives down 45 minutes from Oshkosh to record our podcast we call Skatosis in my office / studio, and then go out to skate the barn ramp, a.k.a. ODS BBC TF. Over the winter we spent a lot of Sundays at Cream City since the barn is not heated and it gets really cold out here in Wisconsin. 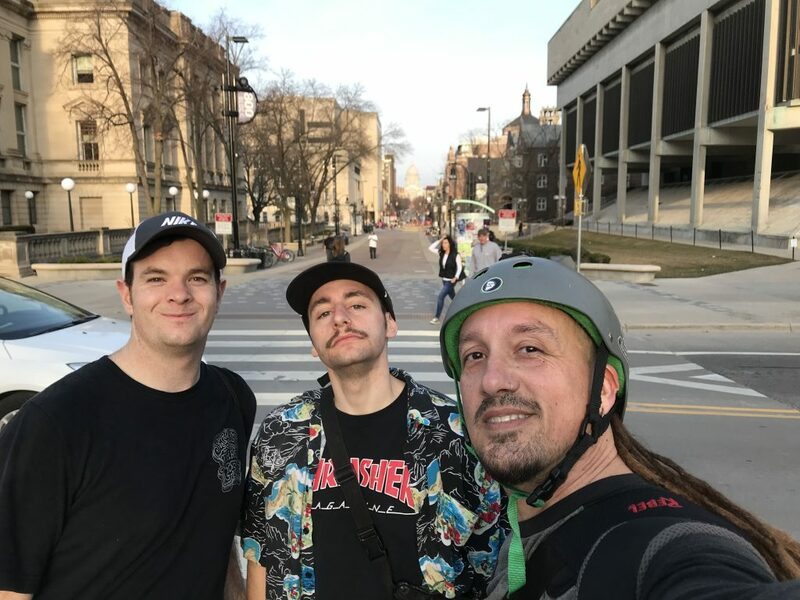 But now that it’s warmer we decided to not only switch from Sunday to Saturday, but we took a road trip to the state capital of Madison with fellow ripper Cody and met up with Hunter and Phil. We met at the skatepark, then headed out into the streets. Not only is the act of skateboarding my passion, it’s all of the peripheral aspects of it too. I’m a consumer as well as a producer. I love taking my camera gear with me and shooting videos throughout the day. Most of the time I set the tripod up so that I can get footage of an area that I’m skating in, but I’ve been trying to focus more on shooting everyone else without a tripod and getting more action shots. So this past weekend, not only did I have an amazing time skateboarding with my friends, but I came home with almost 2 hours of footage. And instead of recording our podcast in the studio, Aaron and I sat at a bus stop on State St. and recorded a short 15 minute show on my phone since I knew we’d never have the energy to record a full show back home. The phone shows are not my favorite method but it’s still fun to sit and talk skateboarding with my cohort. I’d drive my wife crazy if it wasn’t for him. We ended the day in the streets. Skatosis #118 podcast video with loose edit for FaceBook and YouTube. Parking Garage Bomb I shot with my iPhone while carrying a backpack and camera bag! Since you can’t upload an mp3 to FaceBook, I started using our footage from that day to use as a backdrop to the audio podcast we record. It works great for YouTube as well. I shot this on my iPhone while carrying my backpack full of pads and my camera bag full of gear. Thankfully it was a mellow grade and we didn’t actually go as fast as I have us going in the video. Thanks to Melora and Rasputina for letting me use all their music. Simply a highlight reel of all of the makes we had that day. Fun way to remember the trip. Hunter always amazes me with what he can do on a skateboard, but this day he got 3 mega tricks that I was proud to capture on my camera. I’m still in awe. I did not intend to make a Slam of the Week clip since I really don’t like watching slams (neither does my wife), but I had the unfortunate privilege to film the gnarliest sack I’ve ever seen in person. Phil took it like a champ, and I’ve heard from him since, so he definitely survived. Phew! Just a highlight reel of my tricks from the trip. A great way for me to keep track of my progression. I’ve been spending a lot of time with Final Cut Pro lately ever since putting together Boy City. I’ve had FCP for a bunch of years now and even produced a couple of documentaries, but it’s been a while and I just upgraded to the latest version. It’s a powerful tool for sure and I know I’m just barely scratching the surface, but after making OTP edits all year on my iPhone with iMovie, it feels like a much bigger and of course more precise playground to play in. Here’s a bunch of links to my most recents efforts as well as the documentaries my wife and I have made that we have for rent/purchase over at ReelHouse. Boy City – The skateboarding film I made that got me onto this FCP kick. These are the 2 movies my wife and I made and we have another in the works about our beloved Jaguar Rescue Center in Costa Rica. When I started up ODS I knew I wanted to create a brand that I could use to show off some of my professional skills within a subject that I love. Skateboards, stickers, shirts, and a podcast were all on the list. I also knew I wanted to create a weekly video to accompany the podcast, so that I could document my progress mostly, but also to help with SEO for the brand. I hadn’t considered doing a real skateboarding video like most other skateboarding brands or skate shops do, but as we kept producing weekly content, I started taking the filming a bit more serious and started saving some of the better clips from each week in hopes of collecting enough to come up with a decent video of me and my crew. I never really had a release date in mind either as I started “stacking clips”, but with the winter taking over and limiting our outdoor skating possibilities, I thought it’d be a good time to see what I had and give it a go. All in all I ended up with about 40 minutes of video that I started trimming from and the final edited version comes in at a tight 16 minutes showcasing 5 of us. My weekly video edits are almost exclusively created on my iPhone with iMovie, simply for the ease of use and accessibility. It’s very easy to crank content out that way, but I wanted this project to be done with a lot more attention to detail, and I especially wanted to edit the footage to music like the pros do. I’ve done some editing in Final Cut Pro, but not enough to be fluent, and so this project was also a way for me to hone my skills for another project I’ve been letting sit around for too long. I’ve had over 60 guys come through the barn for a session, but the main dudes that have made the effort to go on trips, or come out to the barn more often now have a reference for their 2017 year of skateboarding. And ever since I created this skate space here on the farm and have all these dudes that come out to skate, it was my wife who called this place, Boy City. Old Dude Skate Co. is the embodiment of a skateboarding graphic designer in his forties, expressing his passion with his tools. From decks, stickers and shirts, to podcasts, video clips and movies, I create content for Old Dudes that Skate. So join me and the Barn Burner Crew on a skateboarding adventure around Wisconsin and Colorado as we celebrate our best clips of 2017. Ever since I built a ramp in my barn, and this crew of mine has continued to grow, my wife has many times called this place Boy City. You ever get one of those pinches in your lower back that just cripples you from even taking a step? I got one of those about a week before the new year and it’s been bothering me a little less each day. I’ve been trying to do stretches, using Skater Balm, resting, and doing a lot of pouting since it’s so cold and of course haven’t been able to skate. I turned down a trip to the skate park last Friday but changed plans to give it a shot on Monday, New years Day, which happened to fall on a Skatosis Monday. We recorded our show and took off to the park for a few hours. My back was feeling pretty good, but I was nervous to see if it could take a good spill, or just allow me to run out of a trick if I needed to bail. I ended up taking a few runs in the bowl and washed out on something minor and bonked my head a bit, but good for me I was wearing my helmet. I ended up just taking it easy the rest of the time and did some filming since my back overall felt pretty decent. So even at the tender age of 46, know that you can still go skate on New Years Day, just like you did when you were a kid! And here’s an edit from our trip to Cream City later that same day. I’ve spent the last year and a half trying to build this brand without blogging directly about it, and my plan is to change that around a lot for 2018. New year, new hustle.